Jesus said, "For where your treasure is, there your heart will be also." (Matthew 6:21 ) God isn't after our money, he wants our hearts...and that's why he asks us to give our money. But don't worry, you can't out-give God. He is generous to us, and wants us to become more like him. It’s easy and quick to give online whether it’s a one time gift or a recurring gift. There is no better investment you can make with your giving than the local church! As an organization, we are accredited by Evangelical Council for Financial Accountability. 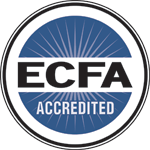 See our ECFA organization profile here.